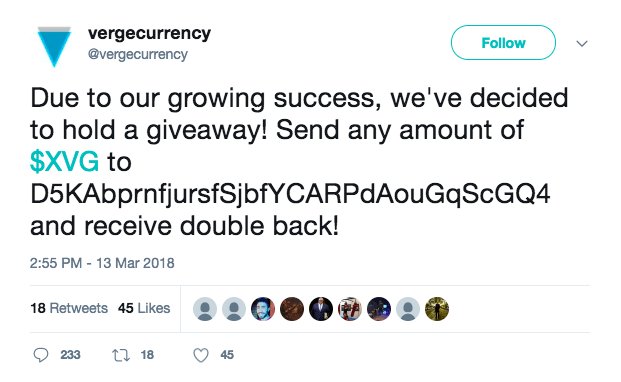 In an ironic turn of events, privacy-focused cryptocurrency Verge (XVG) got its Twitter account hacked yesterday. According to Verge team members on Telegram, no funds were at risk at any point in time and the breach was exclusively limited to its social media profiles. Once in control of the account, the hackers proceeded to ask Verge followers to donate XVG to a fraudulent wallet for a chance to receive double the amount in return – a new scam tactic which has been running rampant in the blockchain space over the past couple of months. The good thing is that the startup has since managed to reclaim control of its Twitter account. It has also deleted the tweets the attackers posted from its account. Those curios to peruse the deceitful tweets can see an archived version of them here and here. At the time of writing, the hackers have received “donations” for a total of 195 XVG (or about $7), according to a quick lookup on the Verge blockchain explorer. As far as the actual breach goes, Verge claims the attackers leveraged leaked Yahoo databases to gain access to the personal accounts of lead developer Justin Vendetta (more commonly known under the pseudonym Sunerok). The hackers then managed to trick AT&T customer support reps into transferring the phone number associated with Vendetta’s personal accounts to a new SIM card. This made it possible to bypass Twitter’s two-factor authentication mechanism. We have retrieved access to our main twitter account @vergecurrency. Huge shout-out to our entire community on helping us spread the word and reassuring the confidence in #vergecurrency during this time. Verge has managed to bounce back from this minor hiccup without taking any significant hits to its value. The currency presently stands at $0.034 – a six-percent dip over the past 24 hours – according to Coin Market Cap. Back in December last year, Verge made waves after controversial security pioneer John McAfee shilled the currency in one of his reckless ‘Coin of the Day’ series, where he recommended “solid” altcoins to cryptocurrency normies. I recommended Verge when it was less than a penny – saying it might rise 100% to two pennies. The price has been wrongly pumped beyond reason by referencing fake Twitter accounts and Instagrams which I have never had and then I am diss'd when I point out the fraud. Please stop. As with anything else he’s done in the blockchain space though, McAfee’s coin recommendations were often poorly researched – and sometimes straight-up misleading. In any case, it seems the hackers went through a lot of trouble for 7 bucks.